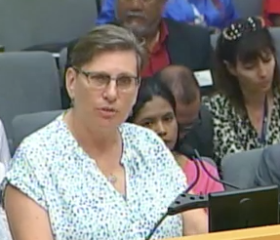 Performing arts teacher Sue Freitag of El Camino Real Charter High School. A $1,139 dinner at a steakhouse. A $95 bottle of fine Syrah wine. A $73 bill for flowers. 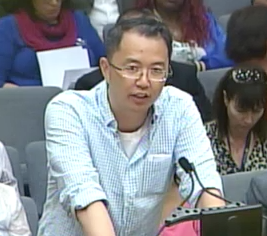 Those charges and others made by staff of a successful charter school were cited this week at an LA Unified School Board meeting and led the district to take the first steps to revoking the school’s charter. El Camino Real Charter High School, which educates 3,600 students in the west San Fernando Valley, was given a Notice of Violations Tuesday that they must answer by Sept. 23, or the district could hold a public hearing to decide whether to revoke the school’s charter and return it to traditional district school status. On Friday morning, all of the correspondence between the district and the school that was provided to the school board members was made public as per a request by board member Monica Ratliff. 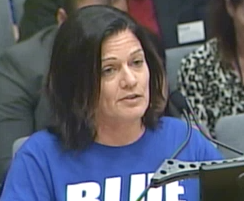 While some of the school board members seemed outraged about the charges against the charter school in more than an hour of debate Tuesday, many teachers who spoke in support of the school said they felt that the district was being too harsh on the school. Some of them supported the expenses on lavish dinners, even though the district rules wouldn’t allow such practices for their own traditional schools. Freitag taught at the school for 14 years when it was a district school and after it became an independent charter school. She is also a member of the teachers union, UTLA, and notes that she is making 7 percent more than she did as a traditional school teacher. She said she has been part of the school family for 32 years, going back to being a student there. The teachers at El Camino Real will be meeting after school on Friday with UTLA members to discuss the issues with the school. The teachers have a separately negotiated UTLA contract that is different than the one for the overall district. Jose Cole-Gutierrez, director of the district’s Charter Schools Division that brought the vote for the Notice of Violations to the school board, said his office noted the “seemingly exorbitant personal and improper expenses” including first-class travel and other expenses into the hundreds of thousands of dollars. He said the school has “the opportunity to remedy concerns noted” including charges on credit cards charged to the school that includes unauthorized travel expense. Although charter schools run independently, they must still follow some overall district rules and procedures, and their charters are renewed by the school board every five years but can be revoked at any time. “We noted credit card activity that is still problematic,” Cole-Gutierrez said. “It does not prohibit the use of personal expenses. It discourages it, but does not prohibit it.” He said the district’s charter division asked for clarifications for the past two years. School board President Steve Zimmer noted that the Notices to Cure from the charter division are common requests, and that the school board doesn’t plan to revoke the school’s charter immediately. Other school board members expressed serious concerns. Board member Scott Schmerelson, who represents the district where El Camino is located, pointed out that each of the teachers speaking for the school was passionate and said “the charter school is excellent and used to have a stellar reputation.” Schmerelson noted a media interview with a school representative who said there was a lot of money in the school’s treasury and the expenses weren’t of concern. Schmerelson said he received many emails from faculty members who said they were happy with the school, but unhappy with the administrators who created these problems. “The great majority of the emails I received were for the school, but against the deeds that were done,” Schmerelson said. Janelle Ruley, a charter rights attorney of Young, Minney & Corr representing the school’s governing board, said the school district’s recent action “feels like a bait-and-switch sucker punch.” She said the school board’s actions are unproductive and said the school answered all the questions in a timely manner and changed some school policies. “Like Charlie Brown kicking a football, charter schools are set up to make compliance mistakes and they’re heavily penalized when they actually do,” Ruley said. She added that the school board action “will expose the district to liability.” Ruley said the school plans to answer all the questions within the deadline, but that didn’t stop the teachers and families from being angry. 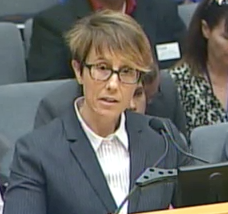 Teacher Gail Turner-Graham pointed out that “El Camino takes care of its teachers” with an average salary scale of $90,000 per teacher last year. She said the school increased classes, clubs and extracurricular activities by more than 15 percent and two college counselors are dedicated specifically for college planning and helping students with credit recovery. She said the school has a waiting list of 1,000 students and has “established a lean operating system,” and support staff increased by more than 40 percent. Chandler pointed out the school won 97 awards in the past five years in athletics. She suggested that the district wanted to take back the school because it was thriving so well and had several million dollars in their coffers for retiree benefits. “Perhaps that’s the problem, we are thriving too much,” said Chandler, who devoted 33 years to the school. 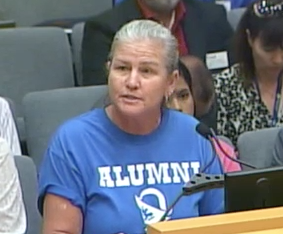 Lori Chandler, teacher and alum at El Camino Real. District officials said they first notified the school of concerns last year, on Sept. 29, 2015 and issued a “Notice to Cure” to explain the irregularities by Oct. 30, 2015. But the faculty and students didn’t know of the issues at the school until the first week of school this year, according to a science teacher at the school for the past 14 years, Dean Sodek. He said the faculty and parents were surprised and it was like “having a kitchen sink lobbed at us” by the district. Sodek said the district paid a total of $1.2 million in oversight fees over the past five years to the district. 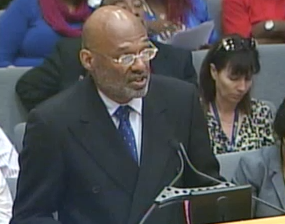 He said the district charter office should offer more assistance to the school. He and other staff members said the district’s actions have shaken up the school. Dermot Givens, an El Camino parent. Parent Dermot Givens, an attorney whose son Damian got into the school through open enrollment, pointed out that his is one of the 8 percent of African-American families at the school. “It is not an all-white upper-class population,” Givens said, adding that his son is fluent in French, learning Mandarin Chinese and a member of the basketball team. Marshall Mayotte, the school’s chief business officer, said the district’s report was a result of “sloppy work and false statements.” He pointed out that his name was mentioned 11 times for charges made on an employee business card and he was not at the restaurants that were named. After the district voted to approve the latest notice to the school, Mayotte said, “We were caught off guard.” He said he didn’t have time to answer the summary of facts before the district made them public. The Los Angeles Daily News conducted an in-depth investigation of the school finances in May that also detailed expenses.